This variant is not meant as a criticism of Richard Borg’s excellent and eminently accessible game of Ancient warfare, it is just that we are inveterate tinkerers who could not resist adding a bit more flavour, particularly to allow us to make use of our extensive collections of 15mm DBM and 25mm WAB Ancient miniature armies. The most significant addition to the 2nd Edition rules is the introduction of facing and, whilst we have endeavoured not to meddle with the core rules, some changes were necessary, particularly with regard to the rules governing retreat. Where any of the original rules have been changed (as opposed to just added to), these are shown in italics. In all instances, in the case of ambiguity between these and the core rules, these rules prevail. All units must at all times face toward a vertex of the hex they occupy. See the diagram below, where the arrow indicates the facing of the unit in the hatched hex. All units have a zone of control (ZOC) extending into the front two hex-sides, marked Z in the diagram. All units must stop the instant they enter an enemy ZOC and move no further that turn, except as a result of combat. Units may, at the beginning of a turn, voluntarily leave an enemy ZOC but may not end that turn adjacent to an enemy unit. Units may only instigate close combat with enemy units occupying hexes marked Z in the diagram. 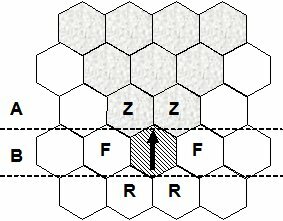 Each unit has flank and rear hex-sides, marked F and R respectively in the diagram. Units with missile firing capability have an arc of fire extending through their front hexes, Z, outwards into (and, in the case of artillery, beyond) the shaded arc shown in the diagram. A unit attacking an enemy flank F gets an additional bonus die-roll if it commenced its turn below line A in the diagram. A unit attacking an enemy in its rear R gets two additional bonus die-rolls if it commenced its turn below line B in the diagram. Units attacking an enemy flank or rear do not get the above bonuses unless they commenced their turn as stated above. However, a unit commencing its turn below line A but above line B would still get a single bonus die-roll if it attacked an enemy in its rear. For the purpose of determining bonuses applicable during momentum advance, a unit’s position at the commencement of the advance is applied. Thus, for example, if a unit commences its turn above line A and attacks an enemy in the flank, it does not get a bonus roll, however, should its attack result in the elimination of that unit, the position of the advancing unit at the instant of momentum advance (as opposed to where it was at the commencement of its turn) is used to determine whether any bonuses apply to any subsequent bonus close combat. A unit battling back against an enemy that has attacked it in the flank or rear (irrespective of whether or not the attacking unit gained any bonus dice in its attack) forfeits -1 and -2 dice respectively. It may then rotate to face its opponent. All units must retreat or evade away from the enemy attacking unit. This may result in a unit retreating toward the enemy board edge. For the first flag rolled, after taking into account bolster morale provided by leaders, adjacent units and terrain, the unit falls back one hex and remains facing the enemy that attacked it. For the second flag rolled the unit retreats the number of hexes indicated on the reference sheet and ends facing away from the enemy that attacked it. For each third and subsequent flag rolled, the unit retreats an additional hex, still facing away from the enemy. Losses are taken per the core rules in situations where units cannot retreat their full allowance. Note that, whilst retreating units may retreat through enemy ZOCs and end adjacent to the enemy (including enemy ZOCs), evading units may not voluntarily evade into or through an enemy ZOC. A unit making a momentum advance must, if possible, make its bonus close combat attack against the retreating unit. Only if the defending unit is eliminated or retreats beyond the attacking unit’s range, may another target be selected. An army may break and retire from the field if its army morale falls below a certain limit. A player may at any time play a Leadership Card, of which there are six in the pack, to have his opponent test for morale. The player playing the card forfeits any other action during the turn the card is so played. The procedure for testing morale is as follows. The player playing the card throws a number of dice equivalent to the number of enemy units (not bases) lost; every flag rolled puts his enemy at risk of retiring, i.e. fleeing, the field of battle. The player testing for morale then rolls the number of dice equivalent to the number of his units (not bases) remaining on the field and must match or exceed the number of flags rolled by his opponent, with helmet symbols. The number of dice rolled by the player testing for morale is adjusted as follows: -2 for loss of CinC; -1 for loss of sub-general; -2 for loss of more than 25% of original number of units; -2 for loss of more than 33% of original number of units; -2 for loss of more than 50% of original number of units. All modifiers are cumulative, so, for example, a player with 12 units in the field who has lost more than 25% of his original force and has also been careless enough to have lost his CinC, would roll 8 dice (12-2-2=8). Missile units are considered to have moved if they have to change facing (rotate) in order to fire on an enemy unit. Heavy bow units are classed as Auxilia Infantry for movement and roll 2 dice in close combat; however, when firing, they have a range of 3 hexes, roll 3 dice on hold and 1 die if they have moved 1 hex (note that they may not fire if they have moved more than 1 hex). Artillery, i.e. light and heavy war machines, comprise 2 bases for each unit. Artillery that rotates forfeits its missile fire for that turn. Units defending fordable rivers, i.e. being attacked by enemy units within a fordable river hex, get to attack first against the attackers, exactly as a First Strike card. This allows units to defend a fordable river bank. A unit commencing and spending its entire turn on a road gains an additional movement allowance of 1 hex. The cost of each unit is generally equivalent to its CC dice as shown on the reference sheet. Thus a light bow unit costs 2 points, whereas a heavy infantry unit costs 5 points. However, due to their shorter missile range, light infantry cost only 1½ points. Camels cost 3 points if light and 4 points if medium cavalry. Light chariots and heavy bow cost 3 points each. Warrior, ballistae and heavy chariot units each cost 4 points; heavy cavalry and catapults cost 5 points; elephants cost 6 points; a CinC costs 20 points and a sub-general, 15 points. Horse cavalry retreat 1 additional hex per flag when battling camelry. Camels ignore 1 hit and 1 flag when attacked by horse cavalry /chariots. Heavy cavalry units comprise 4 bases, rather than the usual 3 bases for cavalry units. Each player gets a base of 1 card for the entire game plus 2 cards for the CinC and 1 card for each sub-general, to a maximum of 6 cards. As generals are lost in combat, so the number of cards is reduced by an equivalent amount. Cards from a player’s hand are not returned if a leader is lost, but new cards are not drawn until the number of cards in a player’s hand has dropped to the new total adjusted for leader loss. Even if a player has lost all of his generals, he will still be entitled to draw and play one card per turn. The players mutually agree on the terrain then roll seven dice each; the player with the most crossed swords chooses the side of the table and will set up first. In cases of ties, re-roll the dice. The players then take turns to deploy their troops, one section at a time of their choice. The player setting up last, plays a card first. Once ancient regular infantry closed in combat with enemy infantry it did not readily disengage, fighting until one side or the other was defeated or retreated in disarray. To simulate this, medium and heavy infantry once engaged with enemy medium or heavy infantry (i.e. in their ZOC) cannot voluntarily disengage and may thus only move if pushed back or retreated. Light foot and all mounted units its may disengage at will. Remember, however, that units voluntarily leaving an enemy ZOC at the beginning of their turn may not end that turn adjacent to an enemy unit. As WAB armies are individually based, I provide the following optional amendments, specifically to suit my Early Imperial Roman and Celtic armies. Fanatic warbands comprise 5 bases and throw 5 dice until they loose a base, thereafter they roll 4 dice. Unlike regular warbands, they ignore the first flag rolled against them irrespective of the number of base losses taken. Fanatics cost 5 points to purchase. Heavy infantry units comprise 6 bases and cost 7 points to purchase. Roman Praetorian Guard heavy infantry units roll 6 dice, ignore 1 flag when attacked and cost 9 points to purchase; the Roman can deploy a maximum of 1 Praetorian unit for every 4 regular heavy infantry in play. One Roman heavy infantry unit must include the legion’s aquilifer carrying the eagle. Every time this unit loses a figure, the attacker rolls 2 dice and captures the eagle on a double-roll of crossed swords. If the unit carrying the eagle is eliminated, the attacker captures the eagle on a single die-roll of crossed swords, otherwise the eagle transfers to another unit within three hexes in a similar manner to an evading leader under the core rules. If the eagle is captured, it is carried by the attacking unit and cannot be transferred to another friendly unit. The Roman player can of course attempt to recapture the eagle in the same manner as above. The Barbarian player may voluntarily exit his own board edge with the unit carrying the legion’s eagle, thereby denying the Roman player the opportunity of recapturing it. The exiting Barbarian unit may not return, but does not count towards the Barbarian’s losses. This is the only circumstance when a unit may leave the game board, other than through elimination. A Roman unit carrying the legion’s eagle, battles back with an additional die and ignores the 1st flag rolled against it. When rolling saving dice for army morale, if the legion’s eagle is in the hands of the enemy, the Roman player subtracts an additional 4 dice from its usual modified dice-roll. The Barbarian player may deploy a Druid shaman unit, comprising 4 figures, at a cost of 8 points. The Druid unit cannot voluntarily attack and battles back with only one die. Any Barbarian units adjacent to the Druid may roll an extra die in close combat and ignore the 1st flag result against them. If the Druid unit is eliminated, the Barbarian player subtracts an additional 2 dice from its usual modified dice-roll when rolling saving dice for army morale. Particular thanks to Jeff Herbert for the basic morale mechanism and to Eric Hall, Glenn Haley, Rob Edgar and Frankie Li for their host of ideas and encouragement. A pdf version of the above rules can be downloaded here.